Ah, I do love slots that include two of my favorite things – fruit and a sense of Oriental well being. 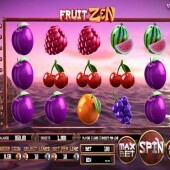 If you're of a similar disposition, this 3D slot Betsoft Gaming slot release - Fruit Zen - is for you. 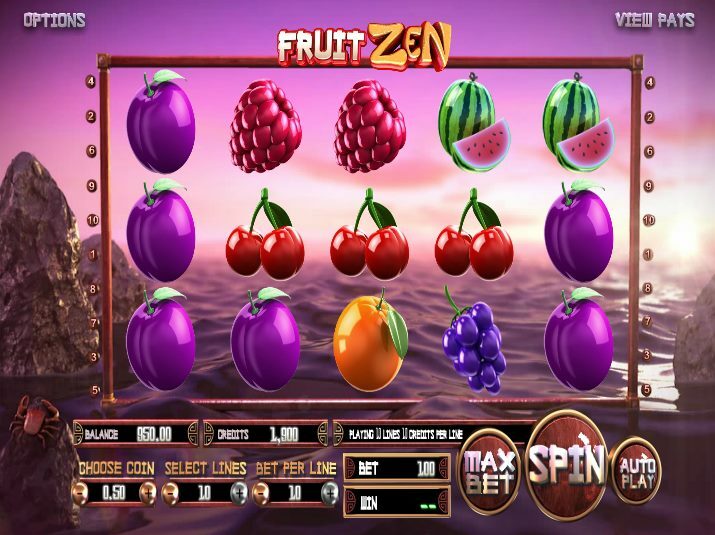 Fruit Zen is a 5-reel, 10-payline slot that mixes aspects of fruit and Oriental spiritualism to create one of the most random themes I think I have ever come across in an online slot. What I immediately love, though, is that you can win up to 200,000 coins in the game. You will not be surprised to hear that the reels are packed full of different fruity symbols in the game. There are your raspberries, blackberries, plums, cherries, oranges, water melons, and lemons - everything a fan of classic Vegas fruit machines is looking for. It is nice to have a slot that doesn’t include the regular 9 through to Ace symbols and it just makes the reels feel more colorful. The reels are also decorated in an Oriental style and font. The Wild symbol is represented by the Fruit Zen Logo and this substitutes for all other symbols to complete winning combinations. There are, unfortunately, no Scatters on this slot which is disappointing, but it does hand the Wild more influence. The Wild has the ability to trigger a Wild reel which gives players the chance to earn more big wins. It is also possible for players to earn up to three Wild reels at the same time. Free spins are awarded with the Wild reels remaining in place for one spin. Sadly, that is it for Fruit Zen in terms of bonus features. It is quite a shallow slot considering Betsoft Gaming are behind it and I was expecting more, to be honest. If you do have a penchant for fruit-themed slots then, a) you’re a bit of an oddball and, b) you might want to check out the fruity-themed release of Fruit Shop from NetEnt or the equally just as fruity-themed Fruit Bonanza by Play’n Go.